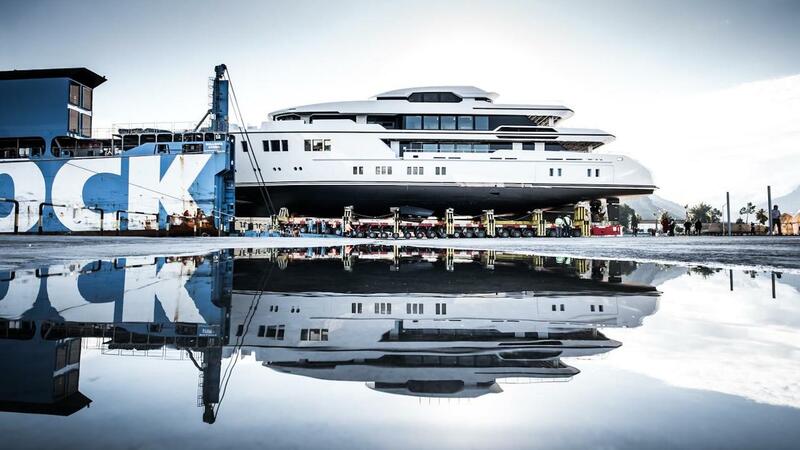 The 63M CUSTOM SUPERYACHT from Sunrise Yachts was launched in 2019 and constructed with a steel hull and aluminium superstructure. 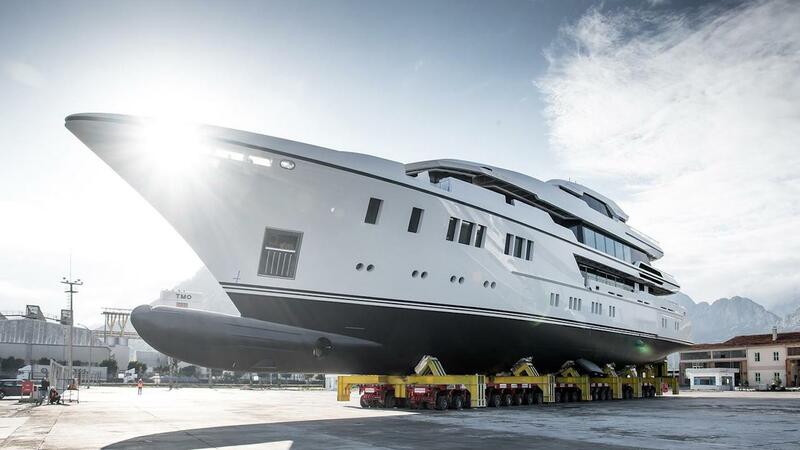 She measures 63m/207ft and is a sistership to M/Y IRIMARI. Her naval architecture is the work of Ozgun Yacht Design and the interior styling of Redman Whiteley Dixon, who chose a variety of materials with different textures in silver, grey and white to manipulate the light in each room. The spacious outdoor areas are designed for hosting parties as much as quiet relaxation, with the sundeck boasting a massive Jacuzzi and a wet bar in addition to plenty of sun loungers and sun beds. The accommodation provides for up to 12 charter guests over six en-suite staterooms, with a crew of 16 to ensure that every guest has everything they could desire throughout the cruise. From the lower deck swim platform guests have access to the sheltered beach club, within which there are two sofas and a coffee table for unwinding close to the water. A starboard staircase connects to the main deck, where a C-shaped sofa lines the stern and a coffee table and aft-facing sofa create an ideal space for taking in the views at sundown or enjoying a light meal and drinks. The upper deck aft is created for alfresco dining, and an impressive table with chairs to seat 14 guests is placed beneath the sundeck overhang. Along the aft, a C-shaped sofa and drinks table is placed on either side of the hull and faces the other seating arrangement. 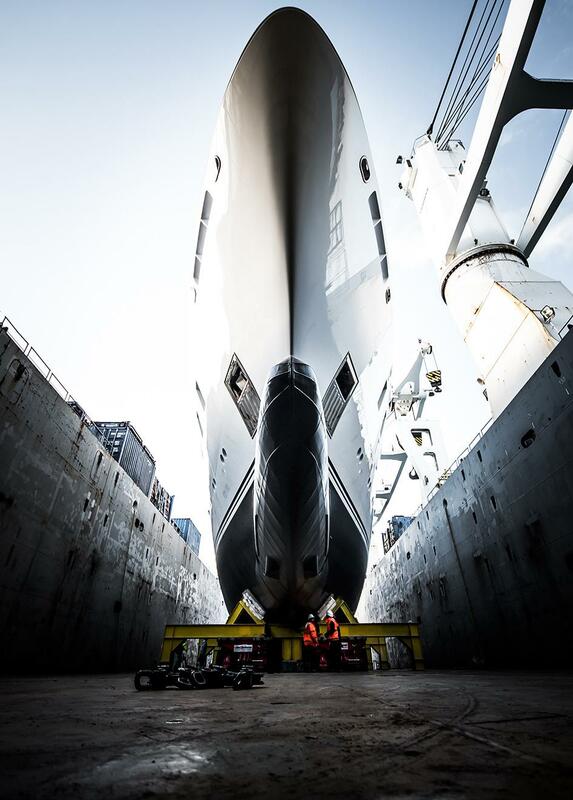 The foredeck is used for storing additional tenders and oversized water toys, which are safely launched and retrieved using a Davit crane. On the sundeck, the forward section features a massive Jacuzzi to fit all 12 guests, with a nearby wet bar to serve cocktails as guests wallow or rest on the surrounding sunbeds. A C-shaped sofa with drinks tables is placed opposite the wet bar. The aft sundeck section hosts numerous sun loungers and two sofa/sunbeds along the stern. Final guest space is available on the top deck, where sunbeds have been placed either side of the communications mast and guests have panoramic views of the surroundings. The lower deck stern hosts the beach club and a gym/massage room with a fold-down terrace to starboard and the large tender garage to port with a side hatch for launch and retrieval. The engine room is forward of the tender garage, followed by the guest accommodation and then the crew accommodation and facilities. On the main deck, the Master suite is placed forward with the VIP stateroom port of the Master office. The galley and crew corridor is directly behind the VIP stateroom, with the main foyer to port. Within the open aft interior, there is a forward formal dining area to seat up to 14 guests, and the aft lounge within the same open-plan environment offers three large sofas and two armchairs around a coffee table. On the bridge deck, the forward bridge places the Captain's chair centre with a sofa to either side to allow the room to be used as a den while at anchor. The Captain's cabin is immediately behind to port with a small salon to starboard containing an L-shaped sofa and widescreen TV for cosy film nights. The aft sky lounge is a spacious environment designed for parties and other large gatherings: A wet bar is located to port with a sofa and for armchairs amidships around a coffee table. A desk is placed near the starboard windows as a quiet spot for guests to enjoy the views while reading during the day. Farther aft, there is a circular table surrounded by chairs for drinks and games, and opposite a coffee table with armchairs drinks tables and a sofa, either side is placed beneath the port aft windows. On the sundeck, the amidships area can be opened up to the elements for a more alfresco experience while unwinding. A dining table and seating for 12 is placed to the aft, with a day head to port and a staircase to starboard. Forward, both corners are a mirror image of each other with an L-shaped sofa and armchairs around a coffee table. A pair of MTU 12V4000 M63 engines allow for a maximum speed of 16 knots and a cruising speed of 12 knots, at which she has a range of 4,500 nautical miles. The accommodation is designed for a maximum of 12 guests over 6 lavish en-suite cabins: 1 Master suite, 1 VIP stateroom, 2 double cabins and 2 twin cabins. ~ The Master suite is placed on the main deck forward and is accessed off the main foyer via the private office. The full-beam Master suite contains a king-sized bed, a port-side dressing table and chair, and a sofa beneath the starboard windows. A walk-in wardrobe is placed to port and starboard of the forward en-suite bathroom, which has two entrances leading to a sink, toilet and bidet. The middle of the en-suite bathroom contains a spacious shared shower. ~ The VIP stateroom is directly behind the main deck Master suite and comes furnished with a king size bed, desk sofa, two closets and an en-suite bathroom with a sink, toilet and shower. ~ Both of the double cabins are aft of the lower deck foyer and placed to port and starboard, with a sliding door between them that can be pulled back to create one spacious cabin. Both cabins have a queen-sized bed, an armchair, a dressing table with a chair, two closets and an en-suite bathroom. One of the cabins has a shower in the en-suite, and the other has a bathtub with a walk-in shower. ~ The twin cabins are placed forward of the foyer and each has a Pullman berth in addition to the two single beds. The en-suite bathrooms both have a toilet, bidet, sink and shower. ~ Cabins for a crew of 16 are located on the lower deck forward along with the crew mess and facilities including laundry. We do have available further amenity, owner and price information for the 63.10m (207') yacht 63M CUSTOM SUPERYACHT, so please enquire for more information.